Sips and bites. Bites and sips. Either way you say it, it’s a winning combination in my book. Of course, there are the go-to sips & bites, like wine + cheese, oysters + bubbly, beer + pizza, which are all delicious. Every once in a while, though, it’s fun to jazz things up. After all, variety is the spice of life, right? 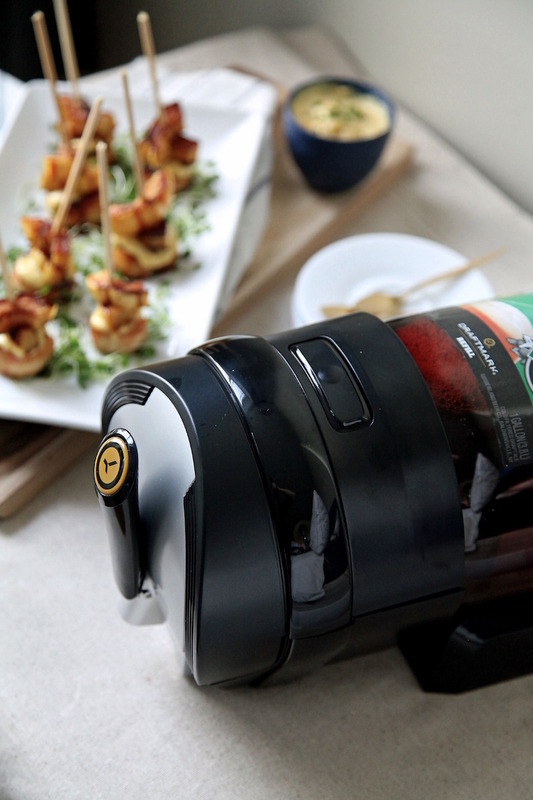 Recently, FreshDirect, in partnership with Draftmark, launched their home tap beer system and get this, it’s small enough to fit in your fridge (yup, even a New York sized one!). Obviously this was something that deserved some celebratory jazzed-up pairings. I chose two of mine and Mr.RC’s favorite brews, Goose Island IPA and Shock Top Belgian White, as a starting point for planning my pairings. From there, I thought about favorite seasonal foods, special dishes I’ve eaten on my fall and winter travels, and the flavors that come through in each beer. I, of course, wanted the dishes to be unique, easy to make, delicious, and, obviously, taste yummy when washed down with its’ brew partner. Seafood isn’t a typical fall/winter food, but I really liked the idea of using scallops for the Shock Top. So instead of eliminating the idea of seafood, I adapted it to the season. I paired it with the more winter-appropriate delicata squash, flavored it with spicy, warm curry flavors and added a healthy helping of butter. The results? A smooth but smokey scallop and squash lollipop that melts in your mouth with just one sip of Shock Top Belgian White. With the Goose Island, I went the more classic sliders-and-brews route. Except venison is anything but classic and this slider route is anything but boring. 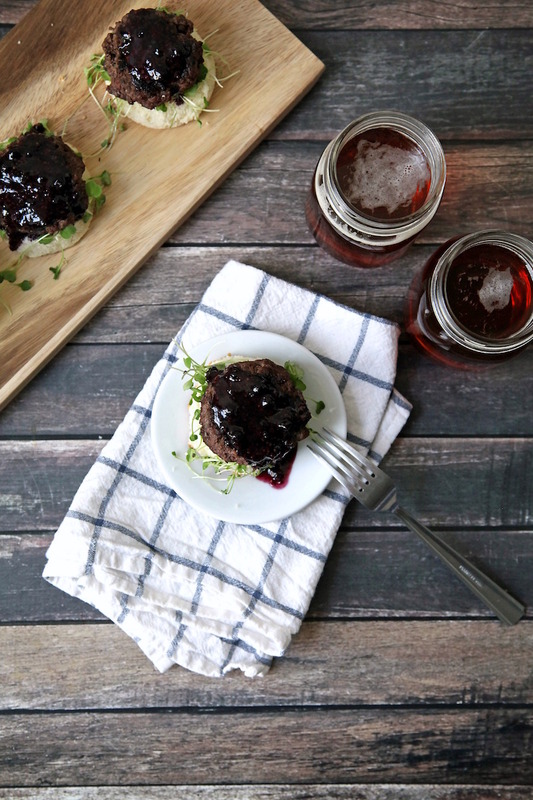 Taking inspiration from one of our favorite Northern Canadian dishes that is served inside a cozy, old red-roofed restaurant in Quebec City, I thought about how I could take the blueberries and venison found in the Trapper’s Treat and make them into a bite-sized delight. And just like that the 5-ingredient venison slider, stuffed with smoked gouda and topped with a blueberry mustard sauce was born. We polished off the whole lot of them with a glass of beer (or 3! ), if that gives you any indication to how good they are. 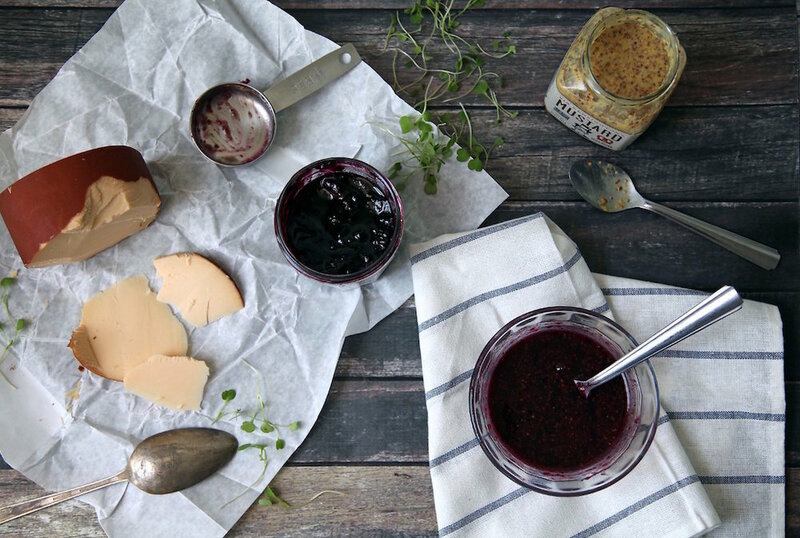 Whether paired with beer or served on their own, both of these bites will be perfect all season long, be it for holiday gatherings, festive appetizers or even down the road while watching the Super Bowl. FYI, for a limited time, FreshDirect is offering a whopping 30% off of the tap system as well as 10% off the brewer's barrels. With such a steep discount on such a genius product, it's an obvious gifting choice (for hosts, brothers, fathers, uncles or even yourself) for the holiday season, and with football games through February, baseball games after that, and the summer grilling season, it’s sure to be a much-used and much-appreciated gift all year long. Cheers! P.S. 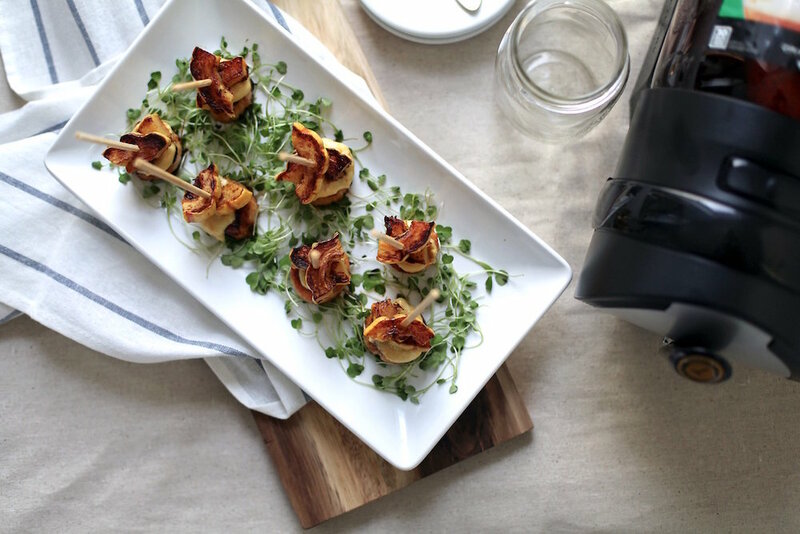 To make these recipes even easier, I've included links to all the products I used right from FreshDirect's site. Just scroll to the very bottom of this post to grab the shopping lists! Preheat oven to 400 degrees. Combine the melted butter and 1 1/2 teaspoons of curry paste in a small bowl and set aside. Slice the delicata squash into approximately 1/4" thick slices, then cut those slices in half (or into thirds, if they're really big). Place them on a baking sheet in a single layer. Brush them with the curry butter mixture. Bake for about 10 minutes, then flip the squash pieces over, brush them with the remaining butter mixture, and bake for about another 10 minutes, or until browned and crispy. Remove from the oven and set them aside until you're ready to assemble the lollipops. While the squash is baking, first mix up your aioli. In a small bowl, combine the mayonnaise, 2 teaspoons of curry paste, orange zest and ginger. Stir until combined. Refrigerate until ready to serve. Next, make the scallops. In a large skillet, set over a medium-high heat burner, melt the butter. Add in the scallops, in a single layer, then squeeze on the orange juice. Cook for about 2-3 minutes, then flip over and cook for another 2-3 minutes. The scallops should look opaque all the way through and have a nice golden brown crust on the outside. To assemble and serve the lollipops, add a layer of greens (I used micro arugula) onto a serving dish. Place the scallops on top, making sure to leave space between each one. Add on a dollop of aioli, then a couple of pieces of squash and finish if off by placing a skewer into the middle of each stack. Serve immediately, with extra aioli on the side. Do not cook the scallops until just before you're ready to serve these. The aioli can be made ahead of time and kept in the refrigerator in an airtight container until you're ready to serve. Form the meat into 6-8 burger patties. Stuff each one with one or two cubes of gouda. Heat a large skillet over medium-high heat. Sear the burgers, approximately 6-8 minutes per side. While the burgers cook, stir the mustard and jam together in a small bowl. Once the burgers have finished cooking, assemble the sliders by placing some micro arugula onto a brioche bun. 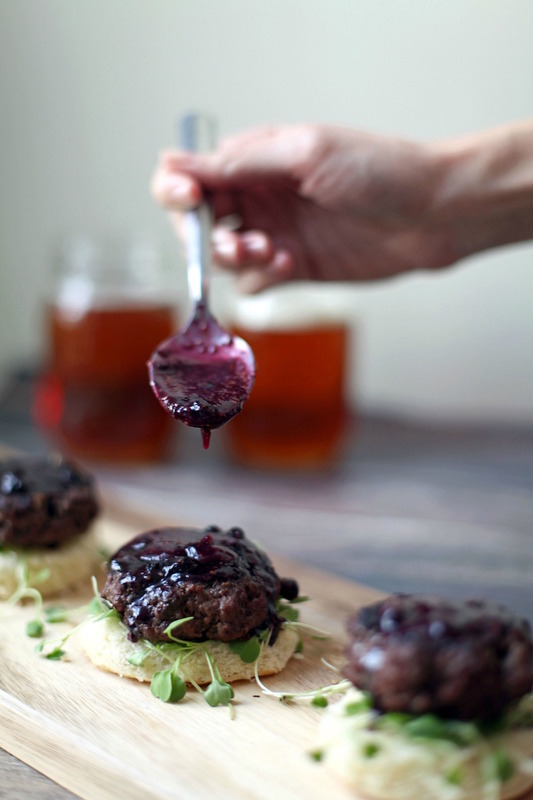 Place a venison patty on top of the greens and finish it off with a generous drizzle of the blueberry mustard. Serve immediately. The burgers should be cooked right before serving. The mustard mixture can be made ahead of time and stored in an airtight container in the refrigerator until ready to use.